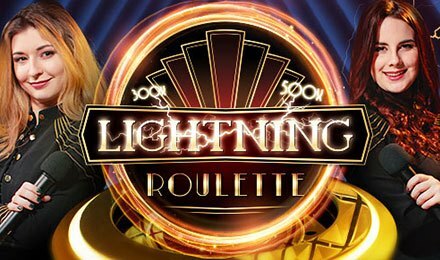 Live Lightning Roulette is a growing version of roulette and has become very popular since its release! It is now available at Vegas Spins Casino, and can be played on mobile, desktop or tablet, also while you’re on the go. Evolution Gaming gives you a roulette game that takes place in a wonderful studio and comes with amazing features to up your gameplay! Live Lightning Roulette is a standard European Wheel that offers simple gameplay. Set your bets on the game board, racetrack bet or using your favourite bet option. Coin Values: Set your chips from £1 to £500. Double any of your bet amounts by clicking on the 2x chip. After setting your bets on Live Lightning Roulette, one to five numbers are selected at random to become stake multipliers. If the ball lands wherever you have predicted, that number becomes your multiplier payout. Multipliers of 50x to 500x can be won, and this happens on every round of the game!